An adept archer, at home in the snow. A true Shadow can shoot while on skis or on foot, and they prefer yew-wood for their bows. They learn the importance of camouflage early in their training, and whole companies of Shadows have been known to sit silently in the snow for days at a time. A Shadow’s unique mastery of shields and other weapons makes them stand out from other archers. 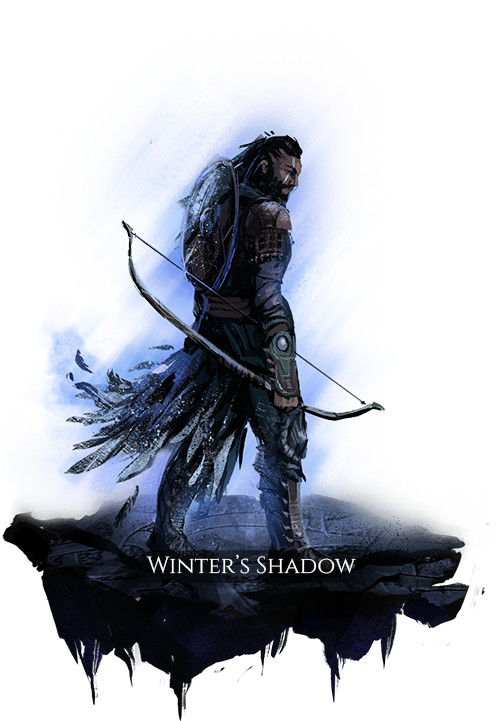 The bows of the Winter’s Shadows may not shoot the furthest, but their battle, survival, and skirmisher skills are impressive; especially for an archer. Sight true, shoot straight, and drink over the corpse. Bow abilities have their power reduced based on the distance they travel to their target. Armor class provided by wearing heavy armor is significantly reduced, and encumbrance from heavy armor is increased. Usable while camouflaged. Fires a powerful shot, which deals high damage and causes panic if striking the target from behind. Quickly loads an arrow with reduced preparation time, based on the damage of the user’s previous shot, within a brief duration. Draws a loaded bow with low preparation and recovery time, but with a penalty to power the longer the draw is held. Uses a shield to slam a hostile target, knocking them back and applying a physical debuff that reduces movement speed and increases ability preparation time for a brief duration. A moderate range projectile that inflicts high damage and causes very high disruption damage if the target’s armor is penetrated. If using a shield, calls on Ullr to create a spectral wall of shields around the user. This wall intercepts blockable attacks against the user and their group members within range for a brief period of time, or until destroyed. Causes a snowstorm to descend from the skies, dealing frost damage over time to nearby enemies. Enemies who remain in the storm for more than a brief duration are affected by a frost debuff that reduces their movement speed for a duration based on their time within the storm. Group members within the storm gain a frost buff that increases their movement speed for a duration based on their time within the storm.